We live and work in the Wasatch Mountains that get over 500 inches of snow per year. With that much snow you have avalanches. 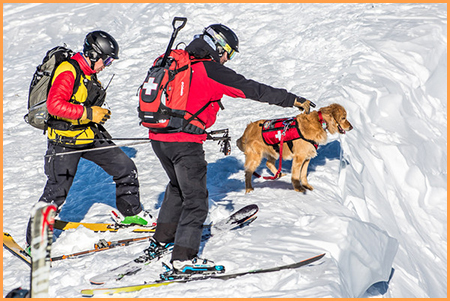 Our avalanche SAR dogs are trained to find victims buried up to 6 feet deep and can search in minutes large areas that would take human searchers hours to cover. Thousands of people go into our mountains for recreation each year. Some of them get lost. Our wilderness SAR dogs can trace the airborne scent of a human for miles across all types of terrain. 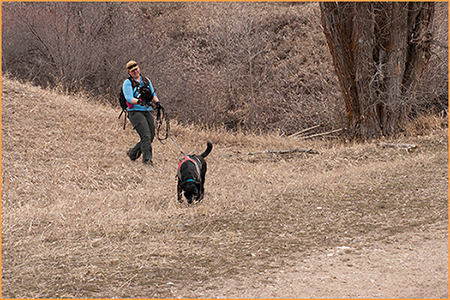 One dog can cover an area that would take many human searchers and do it faster. Then, just like Lassie, they come back to their handler and lead him/her to the lost person. Another way a K-9 rescuer can find a lost person is by tracking the scent the victim leaves along the ground. This works especially well if we know a point where the victim was last seen, such as an abandoned car. We often think of Bloodhounds when we talk of tracking but many dogs can be excellent trackers. Often, tracking and air scent dogs will work together on a search. The mountains and wilderness can be harsh and, unfortunately, some rescues become recovery operations. It is important to find the remains of victims to help the families to deal with their loss. 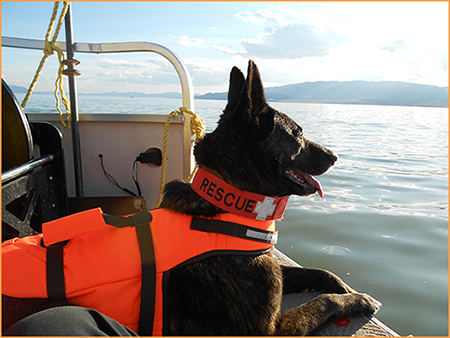 Our dogs are trained to find human remains both on land and submerged under water. Also, the dogs are trained not to disturb the remains but to give their handler a passive signal so that the remains can be properly cared for. This is particularly important to law enforcement if the victim is found in a possible crime scene area.